The DVD Archive Review: Shown in black and white for the better part of fifteen to twenty minutes, was in fact to show respect to the original “Wizard of Oz” starring Judy Garland (which still baffles me, as to where the colour came from at such an early age of cinema), and executes a great opt out into colour when Oscar Diggs – The Great Oz – enters the land where lies the Emerald City. Before this, of course, he is found by Theodora (Mila Kunis) the sister of Evanora (Rachel Weisz), who together make up the Witches of the East and West (though this is not revealed). Telling Oscar about a prophecy of old where a great wizard would come and save the people of Oz from the terror and tyranny of an evil witch who, by the understanding of Theodora, the one they talk of destroying is that of Glinda (Michelle Williams), who has entrapped the power of Oz. Upon hearing of a wealth of treasure and the seating of the throne over the land as a King for the victorious wizard – but only by destroying the witch…by destroying her wand – Oscar does only that which Oscar would do in a time like this – accept the quest and assure the good witches that he will destroy the evil witch. It is the perfect pitch to the perfect children’s fairy-tale adventure that would catch the imagination of children all over the world, although the start of the film would not favour any child’s imagination in the way of climbing over the Innuendos that follow until such a time as when Oscar (James Franco) actually arrives in Oz itself. Even then, as soon as he disembarks unwillingly with his tail between his legs, we find that we are treated to the very same treatment of innuendos thrown at the witch. Okay, so, I am a great James Franco fan and a firm believer that the man can work miracles. However, in “Oz the Great and Powerful”, we would better say that his connection with the film here be that of being the “Wonderful Wizard” and not some philanthropist out to gain, conquer and control the minds of every woman he meets. Other than this the film seems as a fine as the original. The storyline is believable, the characters hold together well, and the outcome of the story is that which everyone is surely expecting – that he will be the man they were expecting – The all Powerful Wizard – and that he will then remain there in Oz until finally Dorothy from Kansas arrives to set him free. Having made his way through the challenges of many missions and quests that would be otherwise doubtful of any other man of his calibre going through, the good Wizard of Oz, once considering himself as a bad person with a bad past, now awaits the knock on the door and the sound of Dorothy Gale’s voice asking for the “Good Wizard” to help her home. Don’t you just love “Happily ever after’s” that have everything so well planned out before you sit down in front of the screen? Unfortunately, for “Oz the Great and Powerful”, there was no real mystery left to infuse the minds of people who had seen the trailers, watched the Special Features and, or read about the actors choice words on taking up the role in the film. Special Effects and the scenes of enemy flying soldiers falling asleep on the “Deadly Poppy Field” were something to savour from the whole film, while everything else seemed to be a desperate run for glory at having been able to complete the filming of a grand movie never before attempted. Of course, the question now is, will this unique film motion picture bring forth a remake of “The Wizard of Oz?” and, if there was ever to be a person of such high regard for to take the helm, would Sam Raimi take the wheel and steer us into an almost “Tim Burton” style epic, or would all those Director’s in favour of the film being left in its original pillar of strength format stand up and say to us all: “You cannot equal, nor outdo a classic”. 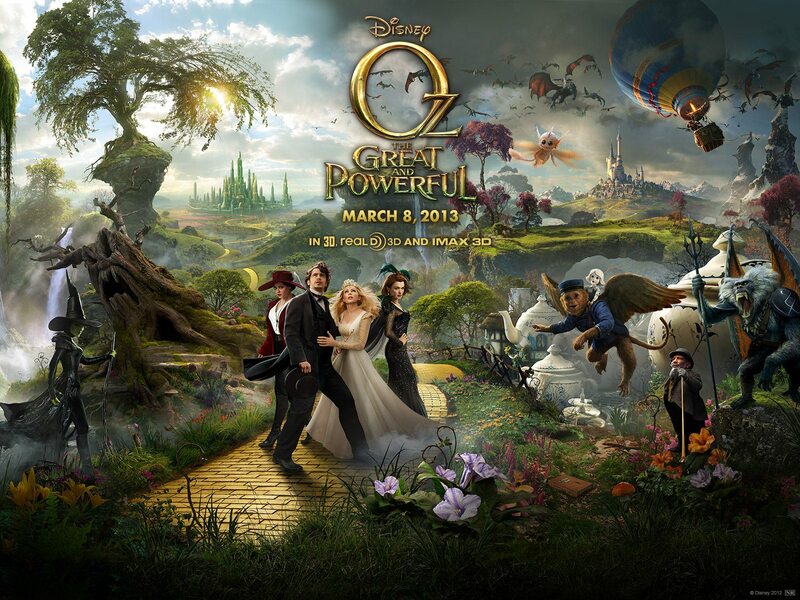 Oz the Great and the Powerful is available to watch at cinemas worldwide now. Posted in Cinema, Film Exclusives, Film Reviews, Trailers and tagged director sam raimi, entertainment, gaming, James Franco, oscars, Oz, The Great, The Powerful, The Wicked Witch, videogames, Walt Disney, walt disney studios. Bookmark the permalink.